This is a brave new world and we are all Columbus in our own right—exploring the vast territory of that which is the Internet. Explorers no longer slice through exotic palms, have devilish good looks, or die of horrific diseases. No, contemporary explorers wade through oceans of data and information, fight against a sea of changing algorithms and advertisements, and battle bravely against armies of online competitors. Blogging for business is one of those constantly-changing territories that is, sadly, unexplored by many contemporary businesses. 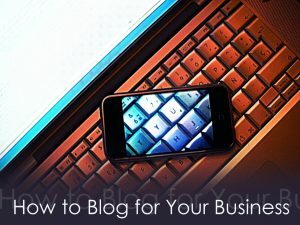 Owners may feel they don’t have the resources to operate a blog, or perhaps they don’t know where to begin or how to incorporate a blog into their business model. A blog is an invaluable resource to your company and web presence and even the simplest of blogs can increase web traffic to your site, establish you as an authority in your industry, and create a trust and bond with your consumer. There are just a few points to consider as a CEO or business owner when determining what type, style, voice, and content to use to get the most out of your business blog. Business blogs have a much easier time determining who their audience is: their consumers! If your company sells lunchboxes, don’t blog about shower curtain cleaning tips. But there’s more to this than meets the eye: a company selling lunchboxes needs to evaluate who their consumer is and target that demographic through language and related topics. If a primary target for a lunchbox company is young mothers, the blogger should write an articles catered toward that demographic, such as “How Busy Moms Can Pack Fast Lunches.” This utilizes the popular “how-to” blog post, and is relatable and uses strong keywords (which we’ll discuss in Part 2). The best thing about blogging to a specific audience is that multiple posts allow you to put that audience into even greater niche-specific groupings for maximum traffic. Do you remember the kid at the front of the class that would answer every single question with as many synonyms and technical words as possible and then smile smugly? Oh, how you hated that kid. Pretentiousness can easily seep into a business blog, especially if it’s being written by someone with years and years of experience. Sometimes heavy jargon is inadvertent, especially if the writer assumes the consumer already understands the technical terms. And while it’s important to seem like an expert in the field and knowledgeable on your topic, you could easily lose a client because they’re seething at your superiority complex, or confused out of their minds trying to understand what you mean. Explain yourself clearly, define terminology, and keep your voice relatable. On the other hand, being too simplistic can drive the consumer just as crazy. A lot of industry blogging advice says “Talk to them like they’re kindergartners.” Don’t do that. Would you want to be talked to that way? Definitely not! Just because a consumer isn’t educated on the industry doesn’t mean they are children. A blog is a conversation that needs to remain respectful and be aware of the consumer’s intelligence. The fastest way to lose clients, lose respect, and lose the power of your blog is to view it as an advertisement. If a business blogger bolds and overuses keywords, misleads with headlines, and uses the blog purely as bait to traffic consumers to their website, they will see plenty of page views with 0% success. A blog is not an ad—it’s a tool. A well-thought out post that a consumer sees as informative or helpful is much more valuable than an overt selling point. This helps build trust between owner/business and consumer and trust leads to returning, happy clients.